Yesterday we took a tour of the island’s north, where the malpais (bad land) fans to the coast, the legacy of eruptions of a chain of volcanos about 5,000 years ago, two of which form the view from our farmhouse, to the west and the north. It is the route Ann took in the first chapter of The Drago Tree, only in reverse. We set off, heading north to Ye, passing through a narrow valley between La Corona, the largest volcano in the chain, and the rounded peaks of the massif. The road is narrow and edged with low dry stone walls. Beyond, the fields of black were alive with euphorbias, the lichens on the rocks bright splodges of white, yellow and orange. Wild grasses and flowers everywhere, the result of recent rain. Usually, there is little green save what the farmers plant and tend. Ye is the same as I recall. A tiny village forgotten by the developers. A string of farmhouses, a few ruins, paradise for someone like me. 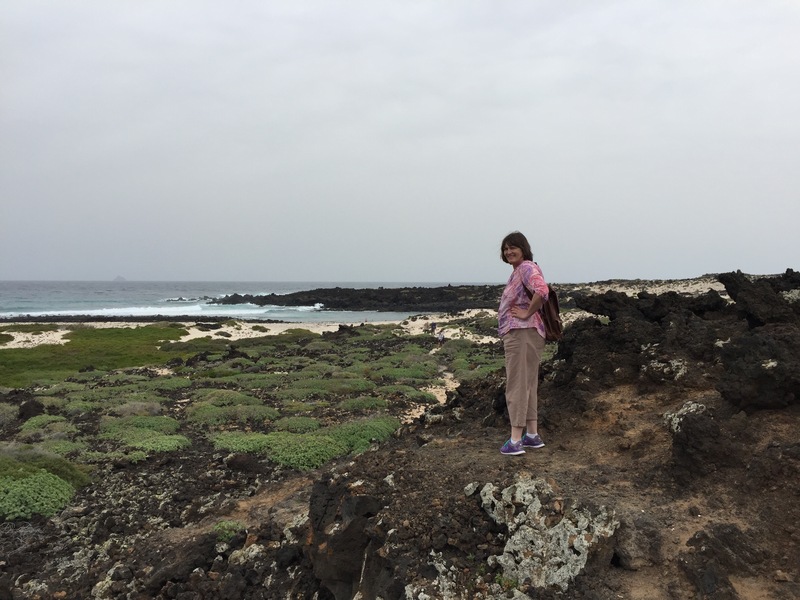 We reached an intersection and headed right, skirting La Corona, the sloping plain to the ocean coated in a lava river, onces a tumbling fury, now a landscape of rugged basalt. For 6 kilometres we drove, taking the narrow lane to Orzola, twisting down between the rock, feeling the weight of it. A primordial scene, vast pillars of basalt protruding from the mass, nature’s standing stones. Everywhere a dance of colour, the lichens and euphorbias that have secured their grip on the landscape burdgeoning. The whole a sight at once painterly and alien. 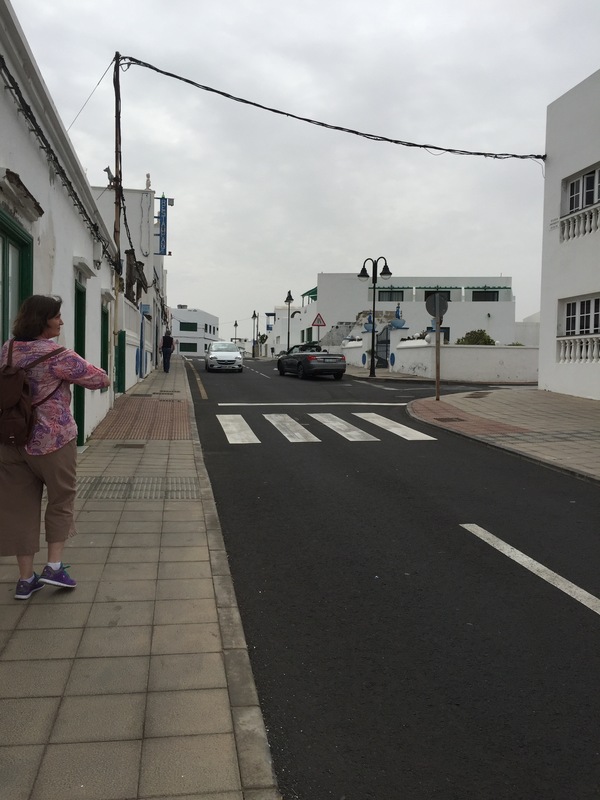 We arrived at the small fishing village of Orzola, which seems today to survive on passing trade to fill its string of restaurants, as tourists take the ferry to the island of La Graciosa nearby. We parked beside a restaurant overlooking the harbour and took a short walk around the block. It was as if I had entered my only story, for Ann had been here, had gazed at the mountains and the cliff, had pointed out features to her companion, just as I was doing with Michelle. And like Ann, we didn’t hang around. Instead, we headed to a remote beach to the west of Orzola, sandwiched by the cliff of El Risco. We pulled up halfway along a narrow track and walked the rest of the way. 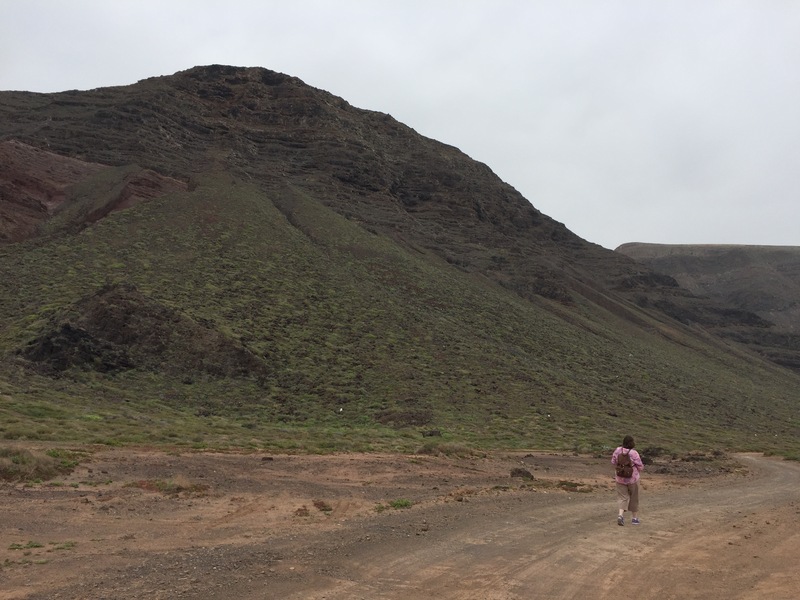 It was a walk like no other, each step bringing us closer to the barren massif, rising steeply, about 400 metres high, baring striations of rock, the jagged razorback of El Risco silhoutted against the sky, the whole a vast wall. The beach itself arcs to the cliff base, the creamy white sand strewn with basalt pebbles of all sizes. We stood in awe watching couples scattered here and there as they also stood in awe. Two guys were ignoring the warning signs and out on surfboards. Walking to the car was strange. I wanted to walk backwards, to watch the cliff recede a little with each step. As if to say goodbye. 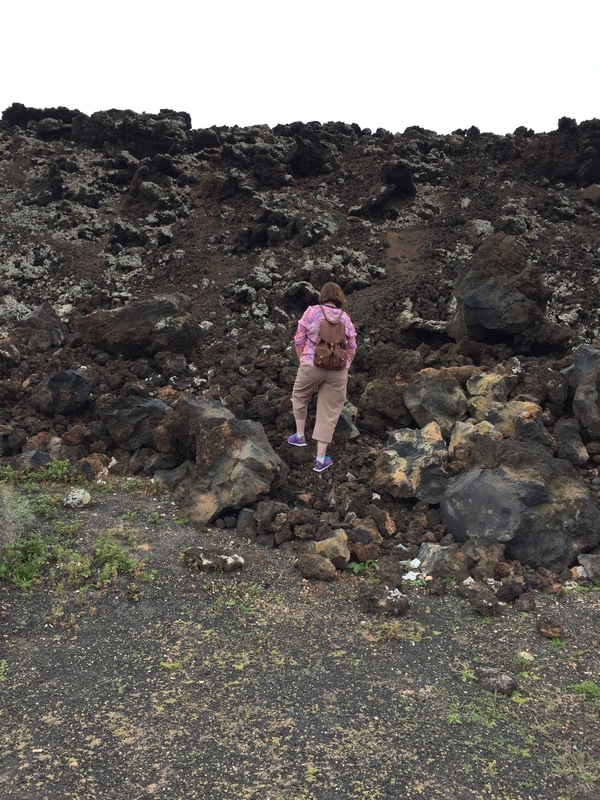 From Orzola we took the coast road to Arrieta, carved along the fringe of the lava flow. Small pebble strewn beaches appeared here and there. Beaches not for swimmers. For paddlers. For those wanting to stand and stare, at the ocean, the malpais, La Corona and the massif. For hours. It’s a shared sentiment. Where I recalled when I was last here no human life other than me, there were cars and people. Not many. Not an amount to disturb. But to be thoroughly alone would mean either luck or a trek into the harsh rock of the malpais. We found a small car park at one beach and stopped briefly, and walked to the shore, and I found a small pebble, the size of a bean, and pocketed it. I was being Ann, for she had done the same. It was as if I was walking in her footsteps, a bizarre feeling. We completed our adventure with lunch beside the little wharf in Arrieta, choosing a restaurant with Spanish-speaking diners. We didn’t speak much. Both of us watched the ocean break on the low cliff to the south, sending up gushes of spume. 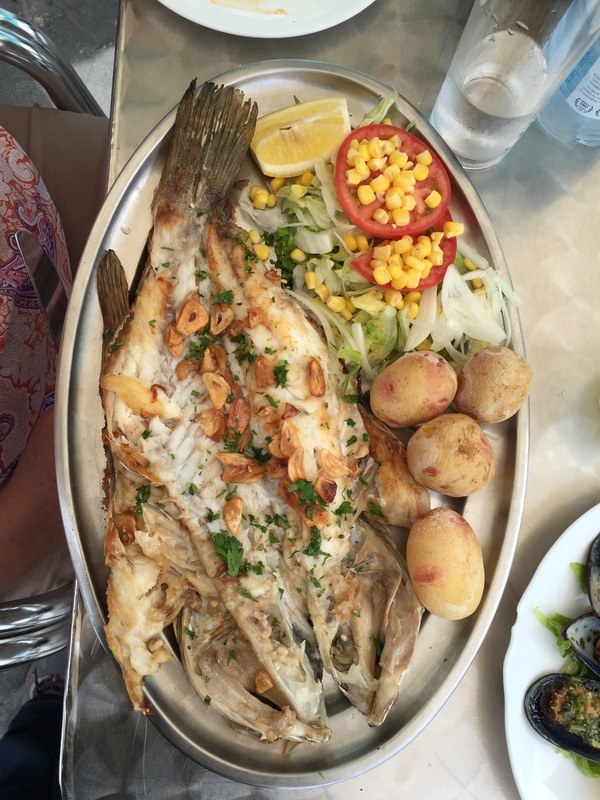 Although I did comment on the fish I ordered, for it was the best fish I have eaten in a long time. 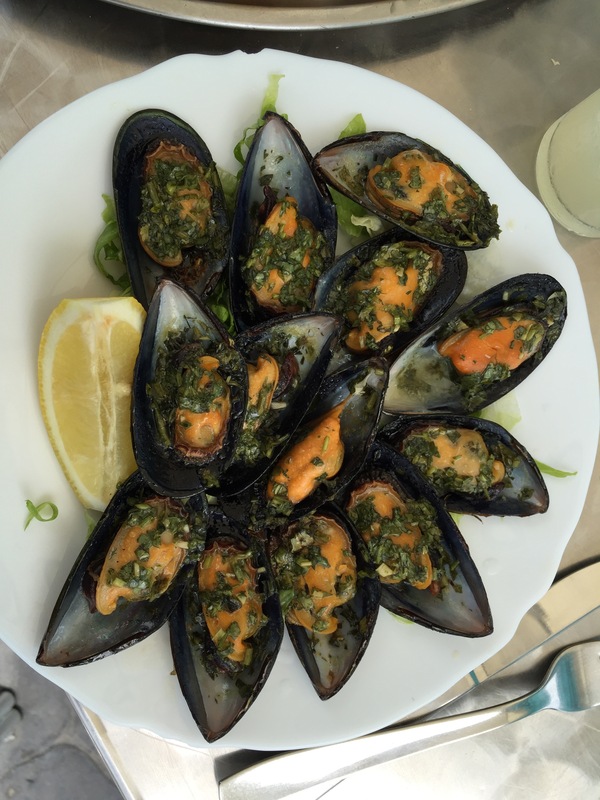 And Michelle tells me her mussels were fine. As if life were in agreement that I must return to this island, and stay not for weeks but months, I found a cheap apartment to rent, just metres from where we had sat on the wharf. It was Michelle’s doing. She wanted to check out the clothes in a boutique nearby, and as she browsed I took the chance to speak Spanish to the owner. How glad I am that I did! The woman spoke slowly and encouraged my efforts and when I explained my wish she told me of her apartment, of the cost, the location, and I knew that what I have been feeling for so long, a profound sense of belonging, was not an illusion, it was just me following life’s trail, picking up the breadcrumbs.